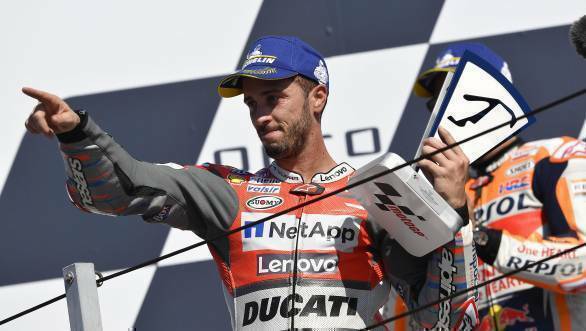 Andrea Dovizioso took his third win of the 2018 MotoGP season, with a fine victory at Misano. 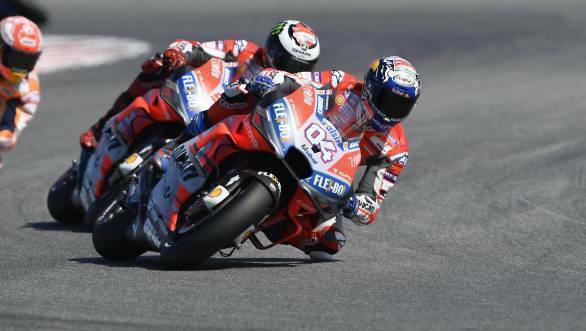 Ducati's Dovi managed to finish ahead of Repsol Honda's Marc Marquez, as Jorge Lorenzo crashed out on the penultimate lap of the race. Dovizioso had managed to get ahead of Lorenzo on the sixth lap of the race. And while Marquez and Lorenzo battled it out on track, Dovizioso was busy pulling away at the head of the field. Towards the end of the race, it seemed like the battle between Lorenzo and Marquez was going to swing in the favour of the Ducati rider, until Lorenzo ended up crashing out at Turn 8 of the track. Even though he would manage to get back on track after his crash, he would finish no higher than 17th place. It was Marquez who was promoted to second place, with Cal Crutchlow in third place for LCR Honda. It was to be the Briton's first trip to the podium since his victory at Argentina earlier this year. Finishing fourth for Suzuki was Alex Rins, while Yamaha's Maverick Vinales finished fifth, while his team-mate Valentino Rossi had to make do with seventh place. Dani Pedrosa finished sixth, splitting the two Yamaha riders. Andrea Iannone finished eighth for Suzuki, with Alvaro Bautista ninth for Angel Nieto Ducati, and Tech 3's Johann Zarco finishing 10th. Danilo Petrucci took eleventh place for Pramac Ducati, having stalled his motorcycle on the warm-up lap. However he still managed to do better than his team-mate Jack Miller, who had qualified on the front row of the grid, but only managed to finish 18th after a crash early on in the race. Twelfth place went to Franco Morbidelli, while Takaaki Nakagami took thirteenth, ahead of Aleix Espargaro and Michele Pirro, the last of the points finishers.